Seeing the Sword of the Spirit. “Drink of it, all of you. which is shed for many, for the remission of sins. My Words are Spirit and They are Life! In the early morning of May 25, of the year 2000, I was asleep on my bed, when in a night vision I found myself standing in front of a man, who was about 30 feet from me and on the same floor level. The person, I was looking at was an ordinary, baldheaded man past middle age, and was clothed in priestly garments of a white robe with a green tunic. NOTE: The color of green universally speaks of new life, of budding and living vegetation; it inspires hope, with the renewal of life and energy. 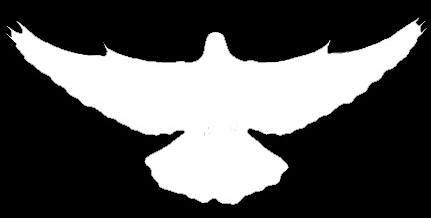 The color white represents light, purity, innocence, joy, triumph and glory. Besides the baldheaded man in priestly garments, I knew that other people were in that room with me. All of us were standing in a lineup in the forefront of that dimly lit room, however from my central position, I did not look around to see who was there. The only light that was in the room was directly over and surrounding that one priestly person standing in what would be the altar portion of the building. My fixation was on that solitary person and the chalice he was embracing with both hands held close to his chest. It was only a moment into the vision, when He extended both arms straight forward, while still holding the chalice with both of his hands; and then he opened his mouth proclaiming very boldly: “Behold the Living Sacrifice”. In the next moment, he turned to his right, to about 45 degrees and began to pan the room from his right to left with his outstretched arms while he continued to hold the chalice with both hands. On my far left I heard an "Ohhhhh", then an "ooh ooh" in quick succession. Momentarily, I thought to myself, surely the communicants were being blessed, but that was the only sounds I heard as I watched the priest as he slowly turned in my direction. 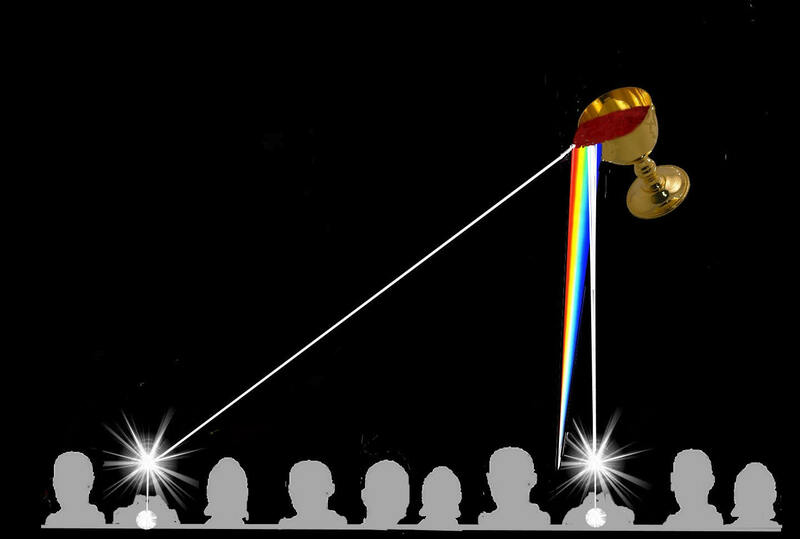 Just before he pointed the chalice towards me, I began to see a multicolored light emanating from the chalice and extending its reach all the way towards me. I was anticipating a blessing, with answers to questions concerning the Communion Blood of Jesus Christ. But, when the multicolored Light came upon me, my head was driven backwards, for I was pierced through the fore head by that beam of Light. Instantaneously there came a silent explosion of white light within my mind, and I grunted out "Oh ohhh": Then in less than a moment, I was stabbed in and through the abdomen and chest by that same piercing white Light, and I cried out “Oooh ooh”! Startled and gravely discomforted, I found myself fully awakened, in a seated position, clutching my belly as if severely wounded and pondering the experience with bewilderment. The dream lasted, I suppose, all of 15 or 20 seconds. However, after the awakening experience, I fell asleep quickly. When I awoke at the appropriate time and well rested, I immediately remembered the bold words, “Behold the Living Sacrifice!” From that day and afterwards, I began to understand the dreams relevancy to the Holy Word's of Jesus Christ and of the inestimable value that God's Living Covenant in Communion provides for the Lord's Church Body: Fear not: I AM the First and the Last: I AM He that lives and was dead; and behold, I AM alive for evermore, Amen: And I have the keys of hell and of death. (Revelation 1 verse 17 thru 18.) Consequently He is able for all time to save those who draw near to God through Him, since He forever lives to make intercession for them. For it was fitting that we should have such a High Priest, Holy, blameless, unstained, separated from sinners, exalted above the heavens. (Hebrews 7 verse 25 thru 26.) No one comes to the Father except by Me! The following scriptural texts are significant to the vision's understanding. Others will follow. Seek you first the Kingdom of God and His Righteousness. I beseech you therefore, brethren, by the mercies of God, that you present your bodies a living sacrifice, holy, acceptable unto God, which is your reasonable (logical) service. And be not conformed to this world: But be you transformed by the renewing of your mind, that you may prove what is that good, and acceptable, and perfect Will of God”. Unfortunately the King James Version of the Bible incorrectly uses an inflated interpretation of the Greek word "praxis" to mean office (of significance) rather than the more correct lowly meaning of function, which would be natural to the differentiated cellular members within the whole body. Jesus said; Verily, verily, I say unto you: If a man keep My Word, he shall never see death. Jesus Christ, the Truth of the Word of His Father God, says: My sheep hear My Voice and I know them, and they follow Me. (See Mark 8 verse 38 and John 10 verse 26 thru 27.) David, the king of Israel, understood the voice of his Shepherd when he wrote in Psalm 23 Thy Rod and Thy staff they comfort me. Now then, we, the baptized members of Jesus Christ, with the submission of our wills to that of God's Will, are freed from any condemnation of our failures in the thoughts and actions of our corruptible flesh. Our collective prayers and petitions are not hindered in our unity within the Spirit of God. The Holy Spirit of God in Christ Jesus, our High Priest, is to be at the forefront of all of the individual members, so that He may raise up the saved into the stature of the One Man Christ Jesus. As members in the Grace of Christ Jesus, we are called to be the light of the world, and as His representatives, we are no longer to be party to the darkness of this world. God's New Covenant of Grace, within the Blood of Jesus Christ, gives the one who lives by the Faith within Christ Jesus, the assurance that God's Spirit will faithfully be correcting the mistakes and curbing the passions of our flesh with the intent of increasing the virtues of Love's Righteousness that is in His Son Christ Jesus. (See 2nd Timothy 3 verse 16 thru 17.) Hereby we perceive the Love of God, because He (Jesus Christ, the Good Shepherd) laid down His Life for us, and we ought to lay down our lives for the brethren. (1st John 3 verse 16.) Coincidentally, the epistle of 1st John chapter 3 verse 16 chimes together in thought with the Gospel of John chapter 3 verse 16. Within the dream, the outcry of the one person, along with mine, made it two fold evident of the vision's true witness. First that the Spirit of God was bearing witness through the visionary dream of the spiritual reality of sin's corrupting condition that remains in our physical body of flesh. Secondly and more importantly, the visionary dream of God's Word of Promise within His New Covenant in the Blood of Jesus Christ is absolute Truth, for He will cleanse and absolve us of our confessed sins of darkness. If we say we have no sin then we deceive ourselves and the Truth is not in us. But if we confess our sins, God is faithful and just to forgive us our sins and cleanse us from all unrighteousness. (See 1st John 1 verse 7 thru 10.) For the God of all Grace, Who has called us unto His Eternal Glory by Christ Jesus, that after you have suffered a while, make you perfect, established, strengthened and settle you. (See 1st Peter 5 verse 5 thru 11.) The piercing Light of God's Sword of the Spirit, revealed the Truth of the sanctifying power of the unseen Spirit of the Communion Blood of Jesus Christ. Tragically, so much of the churches in their disunity, are dismissive of 1st John chapter 1 Verse 7 that speaks of the Communion/Fellowship that we are to have in the Blood of Jesus Christ. With repentance, the darkness of our sins of the flesh, are put under the cleansing Blood of Jesus Christ, through God's Holy Spirit of Grace, so that the Love of God might reign in the spirit of our minds, all to the Glory of God Almighty. God is faithful to His Covenant Word that is sealed in the Sacrificial Blood of Jesus Christ: For the Spirit of Grace that is in Christ's Blood will cleanse our yielded hearts and souls from the wants of sin that are insidious to our idolatrous flesh. For if we walk in the Light, as He is in the Light, we have fellowship one with another, and the Blood of Jesus Christ God's Son, cleanses us from [the weight of] all sin. Jesus the Word of His Father says: The Words I Speak to you are Spirit and They are Life. To be frank, I thought that the others that were gathered in that room with me, would have responded to the Spirit of the Word of God. However, only one other person opened his heart to the Lord to receive of the Lord's Provisions for renewing Life in Him. Behold, I stand at the door and knock: If any man hear My Voice, and open the door, Then will I come into him, and will sup with him and he with Me. (See Revelation 2 verse 17 and chapter 3 verse 20.) The True Provisions of Life are that which the Lord Alone Provides through His Spirit of Grace. Apparently, if the present unbelief and confusion continues in the teaching on Holy Communion, then not all will receive the Truth of the Spirit of the Word of God nor will they respond to God's Sanctifying Word in Holy Communion that removes the burden of sin from the spirit of our minds. (See James 1 verse 21 thru 24.) Then again, maybe there was only the two of us who struggle with the unruliness of our own flesh. If the humility of a person's heart is not evident to God, then vanity reigns in the communion rite of men, and not the leading God's Holy Spirit of Grace and Truth. Holy Communion, by and through God's Holy Spirit of Grace, is intended for Baptized believers, who are settled within the heart of their minds to follow the fullness of the Words of their Chief Physician Christ Jesus. (See Matthew 9 verse 9 thru 13.) If the old vessels are settled in their unbelief without repentance, then it would be very foolish to partake of the the Holy Spirit's Provisions of the Lamb of God. The New Wine of the Spirit of God is for the new created wine skins of Faith that abides in their Savior, Jesus/Yeshua the Messiah. The Infinite all-knowing Almighty God knows from the beginning of time those who belong to Him. Not one of us are justified in a perfunctory performance in Holy Communion. Holy God Almighty, has called us to humility and to repent of our sins, leaving the imprisoning chains of our sin under the Blood of His Son, and then trust in God Almighty's Faithful Word that our souls and the spirit of our minds are in His Spirit's care. The prison doors are already opened, and His reproof through the covering Love of God in Christ Jesus will bring the redeemed into the perfection of His Love that passes all human understanding. Before this Communion visionary dream, and along with those visions in the chapter "Arise Shine", I initially saw Scripture in a singular perspective, relating only to the selfish sensitivities of my own person, and not to that which is necessary for the wholeness of all the members within the One Body of Jesus Christ. This visionary dream became a spiritual revelation or awakening of the spiritual heart of my mind's spirit and soul, and not necessarily applicable to the desires of one's own selfish flesh. Indeed, the blessing of the flesh that I might have desired or anticipated, did not take place, although this does not preclude God from giving a healing to a condition within our physical bodies at His own wise discretion and purpose in glorifying His very own Word, Jesus Christ. God enlarges our Faith in Who He Is, and what He can do through His Spirit that resides within His obedient people of His Faith. That Faith is not a faith that glories in the flesh that perishes along with its excesses. For the sons of God are those that are led by the Spirit of Yahweh God Almighty, and are crucifying the sinful will of the flesh. (See Galatians 5 verse 24 thru 25.) Without humility there is no repentance, without repentance there is no remission of sin, without the remission of sin there is no power of the Holy Spirit, for God is Holy and not party to our sin. Believe thou not that I Am in the Father, and the Father in Me? The words that I speak unto you I speak not of Myself: but The Father that dwells in Me; He [the Father] does the works. Believe Me; I Am in the Father, and the Father in Me: or else believe Me for the very works' sake. It is during the Lord's Passover Communion with Unleavened Bread during His Table of New Covenant Grace that Jesus instructs His disciples in the Word of His Father: 'The Father that dwells in Me, He does the work. (first) If you live in Me and (\second) My Words live within you, (third) Then you shall ask what you will (according to the sanctifying Word of God) and it shall be done for you. And then again Jesus/Yeshua say: Without Me you can do nothing! (John 15 verse 5.) When seeking the Grace of God through a genuine Faith in the Word of the Almighty God, then the members of the Body of Christ are to be strengthened together in their functioning charism gifts of the Spirit of God within the One Holy Body of Jesus Christ. In the natural, there are certain healings that can take place through the wisdom that people have received from God, and that wisdom may grow from an understanding of the nature of this natural body in conjunction with God's designed order of nature itself. Even the wisdom of faith in God, does not allow for the continued abuse of His natural law, and perhaps the appetite of the flesh may need to be curbed or adjusted to bring about a change. All healing first takes place inwardly, and then God's Grace may be manifested outwardly. Now, for a child of God with abiding faith in the power of God, obedience to the Word of God comes first, then comes God's blessings, working within the living members of the Body of Jesus Christ. Even in the midst of the storms of this earthly life, God's Spirit of Life brings about a sense of well being within the spirits of His new creations in Christ Jesus. The Love of God is manifested to the redeemed, first occurring within our souls and the spirit of our minds, and then that same Love of God within us, is to be manifested in the Power of His Love to the lost souls of this perishing world. The charisma Grace of the abiding Spirit of God within the souls of Faith, enables the manifestations of the Almighty's Power within and without of the sanctified members of the One Body of the Living Sacrifice, Jesus Christ. The Living Grace of God is all given for the Glorification of the only Almighty God of the Living. (See 1st Corinthians 12 verse 4 thru 14.) Though the Holy Spirit of the Living God Almighty nothing is impossible: Therefore the manifestations of the Faith of Christ Jesus working within the functioning members of His Body is not limited to natural wisdom. As we continue in the Way of Jesus Christ, we will see there is dynamic “Power in the Blood”, with unseen dimensions of enabling Life in the Communion Covenant Blood of Jesus Christ. The Blood of Jesus Christ is One with the Word of His Father of Life, and the Blood is enabled, both to kill and make alive, and to wound and heal through the two edged Sword of the Holy Spirit of the Eternal God Almighty. Greater emphasis on the Covenant Blood of Jesus and its spiritual affects on the soul and spirit of man will be presented in the following section 'The Crucible', but presently let us continue to always look to our Lord Jesus, the Living Sacrifice of God. To proceed to the next chapter, please click on The Living Sacrifice.